When I was a kid we used to spend the holidays at my mom’s best friend’s house down the street and aside from it being one of my favorite nights of the year, it was also the night that I got to indulge in my favorite party snack: artichoke dip. I would eat so much of it that I would feel ill in minutes. To this day, I still repeat the same routine when it’s in front of me. Throughout the years I’ve adapted a few family friends’ recipes and always cringe when I see the amount of cheese and mayonnaise that I’m about to dig into. Yet, I still cannot resist it. Tonight, I decided to try to health it up a bit, with hopes of not sacrificing flavor. To my astonishment, it worked! Add olive oil and shallots to small/medium pan and cook over medium heat until caramelized. Add garlic and saute for a few more minutes over medium-low heat or until garlic is soft but not brown. Set aside. To make pint nut cheese, combine all ingredients in a food processor and blend until smooth but a little bit grainy still. Add more nutritional yeast and salt to taste. Make the Cashew mayo according to recipe here. 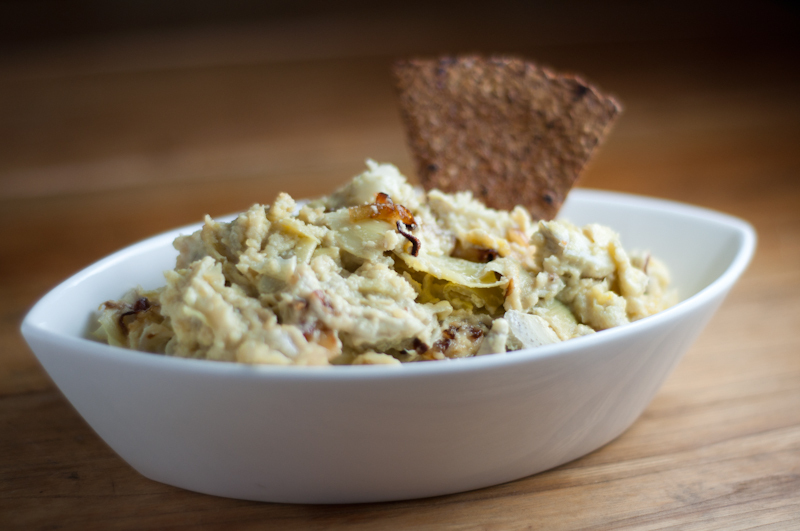 In a small pyrex, combine artichokes, pine nut cheese, cashew mayo, shallots and garlic and mix together with a spoon. Taste and add salt if needed. Bake in oven for about 15 minutes at 350 degrees – until hot all the way through. Could you just substitute Vegenaise for the Cashew Mayo? How much would the recipe need? I’m sure it would work fine!